Thailand Week Trade Fair and Business Opportunity with Thailand opens today 9th March 2018 in BMICH. The Grand opening was honored by the presence of Hon. Malik Samarawickrama, Minister of Development Strategies and International Trade along with H.E. Mrs. Chulamanee Chartsuwan Ambassador of Thailand to Sri Lanka. Ms. Jittima Nakamano, Director of Thai Trade Center, Chennai the organizer of this event proudly presents the 2nd edition of Thailand Week in Colombo again this year to showcase the best quality products from Thailand for Sri Lankan to SHOP and TRADE directly with Thai entrepreneurs as well as to TASTE and EXPERIENCE Thai cuisine and cultural shows under one roof. The inauguration followed by the Business Matching Forum with 30 selected companies from Thailand featuring more than 100 quality products directly from Thailand and the special seminar on “Sri Lanka – Thailand Strategic Partnership in the Making Perspective on trade, investment and development opportunities between Thailand and Sri Lanka” organized in collaboration with the Royal Thai Embassy, Colombo and Ministry of Development Strategies and International Trade of Sri Lanka along with the panelist from Export Development Board of Sri Lanka. Trade Day (B2B) and Special Seminar on 9th March 2018. 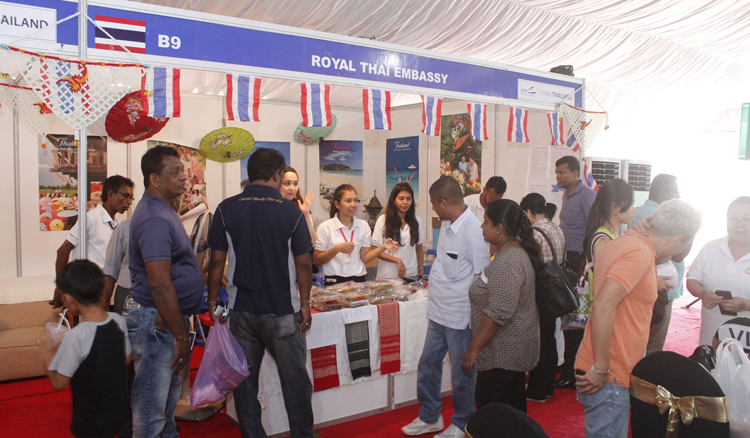 Visit 2nd Thailand Week for new business opportunities whilst experience authentic Thai food and delightful cultural shows. Stand a chance to win Thai Airways round trip air ticket to Thailand and hotel vouchers in Bangkok and Pattaya.